INDUSTRY.co.id - Jakarta - The growing market demand is pushing smartphone companies to compete to create and adapt the latest technology that is ready to answer the needs of the technology and lifestyle of users, one of which is a full-screen display known as the Fullview Display concept. No exception Vivo, while launching Vivo V7+ as its new flagship product on September 28, 2017, is not only ready to pamper selfie lovers with 24MP front camera quality as the world's first revolutionary camera feature, but also provides a better cinematic visual experience with display full screen with no buttons and minimal frames ready to pamper the users. play games as well as chat. Although carrying the 5.99 inch screen, Vivo V7 + remains comfortable grasped thanks to the ratio of the screen to the smartphone body that reached 84.4%. Weighing 160 grams, Vivo V7 + is relatively lighter when compared with smartphone products that have a 5.5 inch screen in general. In comparison, users can enjoy the same screen specifications that are also owned by other premium smartphone products, with a more affordable price of Rp 4.699 million. Brand Manager of PT Vivo Mobile Indonesia, Edy Kusuma said, V7 + was created to answer the needs of users, especially millennial generation to remain active and productive. "Carrying the concept of modern and sophisticated Fullview Display, we believe Vivo V7 + will provide a cinematic visual experience that is much better in every moment" Edy said through a written statement to INDUSTRY.co.id received Wednesday (18/10/2017). 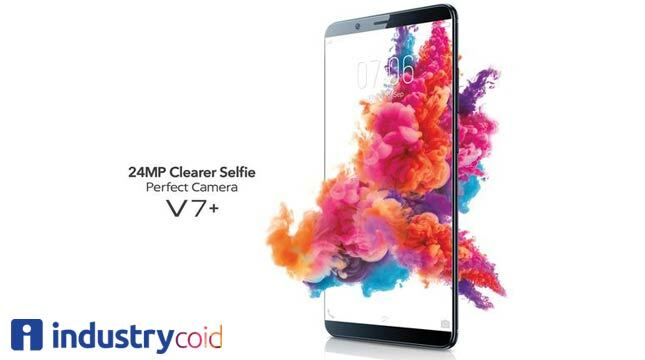 In addition to being packed with the concept of FullView Display is neat and comfortable to use, Vivo V7 + also comes with game mode features that make the users freely play the game without being bothered by messages and incoming calls. In addition, users are also spoiled with the technology of Smart Split 3.0 technology that has been upgraded on Vivo V7 + to provide more choice of applications to be duplicated. Users can be more flexible to stay connected with incoming messages even when watching their favorite videos or playing games. Simply click to split the screen into two. Users can also easily slide three fingers down on the screen to open other apps in separate screens. This applies to any app like Video Streaming, Facebook, Line, Messages, Viber, WeChat, WhatsApp, YouTube, Videos, Play Movies & TV, VLC for Android and MX Player, and many more.